Beep was blowing bubbles in the yard. I captured this beauty just before it burst. No editing or post processing, it's SOOC, the real thing! So much in the reflection, sky, clouds, trees, and more. Wow, what a fantastic capture, and such a perfect bubble, Karen! What a beautiful photography. I am having a great time to day. What a gorgeous image!! Enjoy your days with Beep. Now, who is a baby lol. Splendid image. This is awesome, Karen!! What an incredible capture!! I love it!! Splendid indeed!! You are SO creative! Hope you and Beep have a wonderful weekend!! Beautiful! A different perspective for SkyWatch Friday! Thanks for sharing ~ love it! Bubble magic indeed, Karen. Perfectly captured. That is AWESOME and groovy! I have never been successful capturing a bubble. Way to go! Wow! What a wonderful capture with all those beautiful colors. Have fun with Beep. Absolutely great! You managed to capture the perfect moment! For one blog a week, this is the best ever. Have you thought of printing cards, this would be perfect!!! Beep, super-duper bubble. Hugs to you all in the hols, Jean. There's a whole beautiful world in that bubble. WOW. And thank you for the reminder about the magic and beauty of bubbles. awwwww, so beautiful!! You two sure do have fun!! Very cool, I love the reflections and the colors. Gorgeous! Happy weekend! You need to frame this for Beep! That is an awesome photo Karen. I know how you feel and I only have the grandkids once a week :) But it is so much fun. Yesterday we made grass heads and had a great time. If it isn't messy it isn't fun. That is a fantastic photo! Have fun with Beep. A magical swirl of colour. This is a great symbol of enchantment. karen this is an amazing shot of this bubble, and think you were right 'on the money' when you pushed the button on the camera. Just gorgeous. hOping you are having an awesome time with your grandaughter. Those are times to remember for sure! what an amazing capture and nothing lucky about that, you are an artist with a brush or a camera!! This is a beautiful shot. Fills my eyes, it does. Which is the greatest compliment I can give. Wow! So so pretty! It's really beautiful and so well photographed!! Fantasy art and finesse! Beautiful bubble! I'm still amazed with this bubble. What a terrific shot! Isn’t it fun finding blues to share? Thanks for playing today. Your summer sounds like a bunch of fun making memories. I really like photographing bubbles. I took some shots on Canada Day and eally ought to go back and see if there's anything publishable. 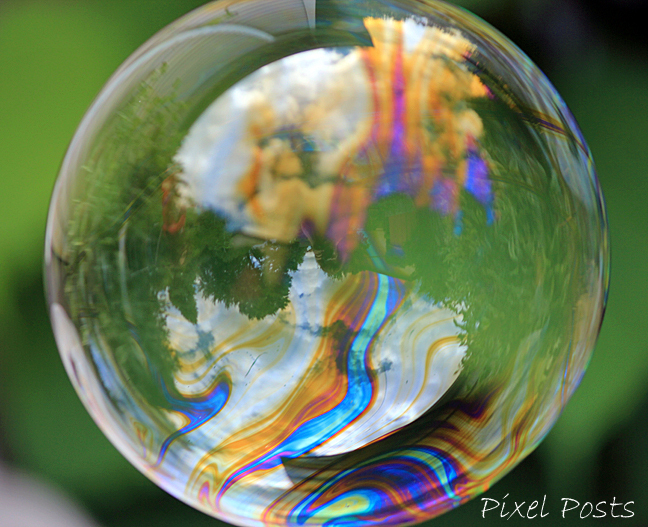 ;0 I love the colours in this bubble! How gorgeous is that, Karen!! Hope you and Beep are having a blast! Super photo of the bubble! They do pop or float away quickly. Wow! You captured it so well! I couldn't have done it so fast! I know how you feel Gramma. We have 2 "beeps" on a Tuesday and for six weeks soon in the school hols. I like your house rules re TV, technology and the like though. Must try that. Have you tried a glass of red wine as soon as Beep is on the way home? Beautiful! Have a great time with Beep! Such a beautiful image! You caught a perfect capture. Have summer fun with Beep!